Obetia radula (Baker) Baker ex B.D.Jacks. Tree-huggers beware - even the trunk of this tree has vicious stinging hairs, which cause both pain and intense itching. 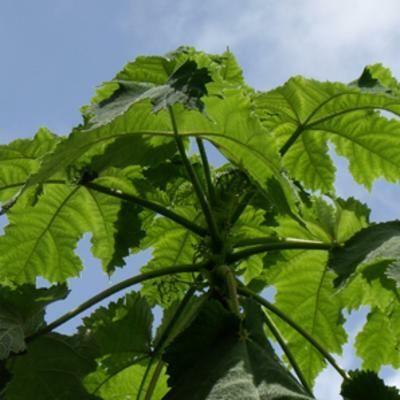 Think of European stinging nettle (Urtica dioica), which is from the same plant family (Urticaceae), and multiply! But from several steps away it is a pretty tree, looking a bit like a papaya tree (Carica papaya). It grows on rocky hillsides in East Africa and Madagascar and, amazingly, people have found a way of using the bark fibres for basketry and rope-making. Sparsely branched tree, 5–13 m. high, presumably dioecious; trunk 0.2–0.5 m. in diameter at base, with main branching points either near the base or at the top, ultimate branchlets ± 0.8 cm. thick when dry, probably more when fresh, covered with large persistent stipules and stinging hairs; wood soft and with much juice in the thick bark and the wide pith; bark grey or brown, smooth to flaky, with very noticeable leaf-scars on the branches; the whole plant has an appearance not unlike a paw-paw, probably always completely deciduous for part of the year. Leaves always clustered at the end of the branches; stipules large, ovate to subcircular, 1.5–2.5 cm. long, 1.2–1.8 cm. wide, acute to acuminate, glabrous or ciliate, long-persistent, green but withering brownish; petiole 8–15 cm., pubescent and with many stinging hairs up to 2.5 mm. long; lamina ovate in outline, usually bullate, 15–25 cm. long and wide, palmately lobed or divided, rarely ± entire, with each lobe triangular, unlobed to ± clearly palmately lobed, base deeply cordate, margin (also of the lobes) serrate, apex (also of lobes) acuminate; lateral nerves 5–7 pairs, basal pair reaching the tip of the basal lobes; upper surface with short hairs and scattered stinging hairs, lower surface densely pubescent, and with scattered stinging hairs on the nerves; cystoliths punctiform, visible from above. Inflorescences in the axils of the current leaves, rarely persisting after the leaves have fallen, profusely branched panicles up to ± 20 cm. long, on peduncles up to ± 5 cm. long, pubescent and with numerous stinging hairs, flowers in small clusters at the branching points or scattered along the axes; ♂ and ♀ rather similar. Male flowers subsessile; perianth globular, up to ± 2 mm. in diameter, 5-merous, with rudimentary ovary present. Female flowers subsessile, 4-merous, perianth up to ± 0.8 mm. in diameter, compressed; stigma prominent penicillate, the whole flower yellow. Male flowers subsessile; perianth globular, up to ± 2 mm. in diameter, 5-merous, with rudimentary ovary present. Female flowers subsessile, 4-merous, perianth up to ± 0.8 mm. in diameter, compressed; stigma prominent penicillate, the whole flower yellow. Achene ± 1–1.5 mm. long. Local on rocky hill-sides in evergreen or semi-evergreen bushland (chiefly on hills of the basement complex, less commonly on basalt and lava), sometimes at rocky lake- and river-shores, and at margins of dry montane forest; 700–2000 m.
The stinging-nettle tree looks a bit like a papaya tree - but it does what its name suggests! Tree-huggers beware - even the trunk of this tree has vicious stinging hairs, which cause both pain and intense itching. 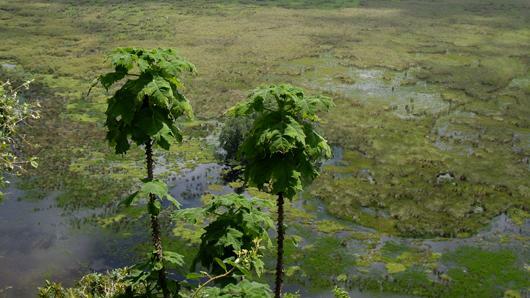 Think of European stinging nettle (Urtica dioica), which is from the same plant family (Urticaceae), and multiply! It grows on rocky hillsides in East Africa and Madagascar and, amazingly, people have found a way of using the bark fibres for basketry and rope-making. Obetia radula is known from only a rather narrow geographic band, stretching from eastern Congo-Kinshasa, through Rwanda, Burundi, Uganda, Kenya and north Tanzania, to Madagascar. It has been found at 500-2,000 m above sea level. Overview: A tree 5-13 m tall, with a sparsely-branched trunk up to 50 cm across, covered in stinging hairs. 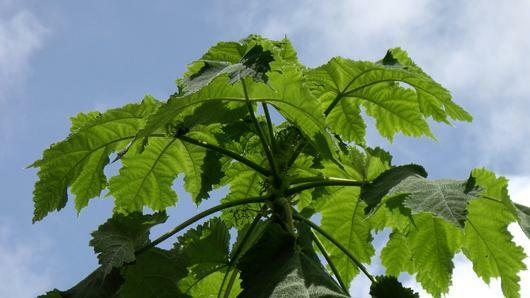 Leaves: The leaves are clustered at the branch ends, and are much lobed, 15-25 × 15-25 cm, with stinging hairs all over. Flowers: The flowers are yellow-green and the male and female flowers are usually borne on separate trees in the axils of leaves. The male flowers are borne in groups up to 10 cm long, and are about 2 mm across. The female flowers are borne in groups up to 30 cm long, and are up to 8 mm across. Fruits: The fruits are minute (less than 2 mm long). 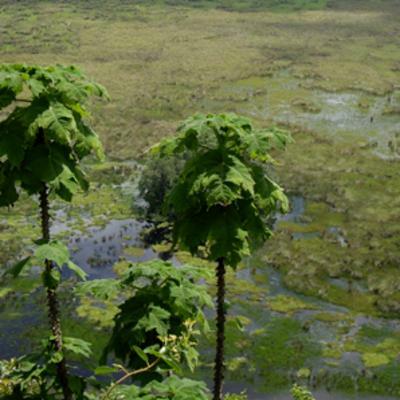 Stinging-nettle tree occurs over a wide area, and there are no specific threats to either its habitat or the species itself. Hence, although an official conservation assessment has not been carried out, it is thought likely this species will be assessed as of Least Concern. The stem fibres of Obetia radula are used to make rope and baskets. Some tribes use the roots as a remedy against barrenness (female infertility). The leaf is used in East Africa to deter rats and moles, as contact with the stinging hairs on the leaves causes intense itching in animals. In Madagascar the bark fibre was formerly used to ignite fires. 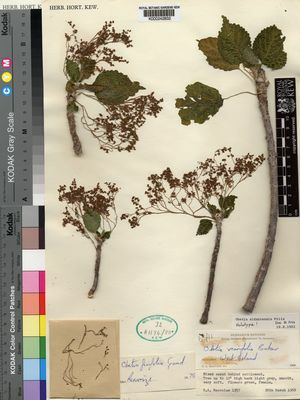 Pressed and dried specimens of Obetia radula are held in the Herbarium, where they are available to researchers from around the world by appointment. 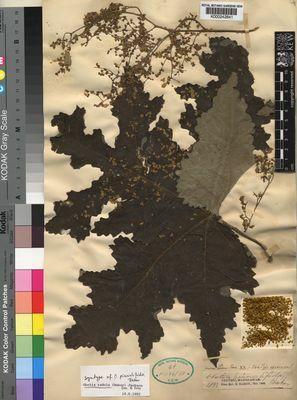 The details of some of these specimens, including images, can be seen online in the Herbarium Catalogue. Not yet assessed according to IUCN Red List criteria, but thought likely to be of Least Concern. The trunk and leaves bear stinging hairs, which can cause pain and intense itching to humans and animals on contact. Friis, I. (1989). Flora of Tropical East Africa, Urticaceae: 1-64. Brink, M. (2009). Obetia radula (Baker) B.D.Jacks. [Internet] Record from Protabase. Brink, M. & Achigan-Dako, E.G. (editors). PROTA (Plant Resources of Tropical Africa), Wageningen, Netherlands. (Accessed 11 March 2011). Beentje, H.J. (1994). Kenya Trees, Shrubs and Lianas. National Museums of Kenya, Nairobi. Friis, I. (1989). Flora of Tropical East Africa: Urticaceae. Balkema, Rotterdam. Friis, I. (1983). A synopsis of Obetia (Urticaceae). Kew Bulletin 38: 221–228. Friis in Kew Bulletin 38: 223 (1983). Troupin, Fl. Rwanda 1: 153 (1978). Leandri in Fl. Madag. 56: 4, fig. 1 (1965). B. D.Jackson in I.K. 3: 323 (1894).